Rent a holiday cottage, apartment, chalet, log cabin or house. Holiday accommodation with leisure facilities, shops and other amenities and entertainment. Traditionally the cheapest most basic form of holiday accommodation. Kids love it . Families with young children do not have many free holiday opportunities apart from staying with grandparents and other relatives. Self catering holidays are a cost effective option for families because once you have paid for travel and accommodation you can live almost as cheaply as you would do at home. It is possible to avoid paying for expensive snacks and drinks in cafes for the children as you would in a hotel or B&B because you can keep a stock of food and drinks at home, and make packed lunches or picnic to take out. 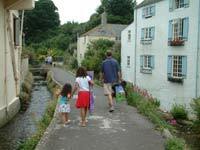 Youth hostels are a low budget option for families and individuals. You may be expected to help with clearing up after meals, sweeping and minor tasks. All these help to foster a cooperative and responsible attitude in children, and help them become team players later in life. Budget conscious families can concentrate on free activities during their holidays. Days out at the beach are relatively free if you pack a picnic and avoid any fun fairs. There are lots of things that you can do such as your own nature walks, visit free parks, museums, and art galleries.